My wife Anne and I took a “cat walk” early evening Oct. 29, 2016—with Fujifilm X-T1 and Fujinon XF18-55mmF2.8-4 R LM OIS lens in tow. My hope: For her to see Chipper outside the apartment building where Copper once lived. We walked down Campus from the canyon side towards Madison. 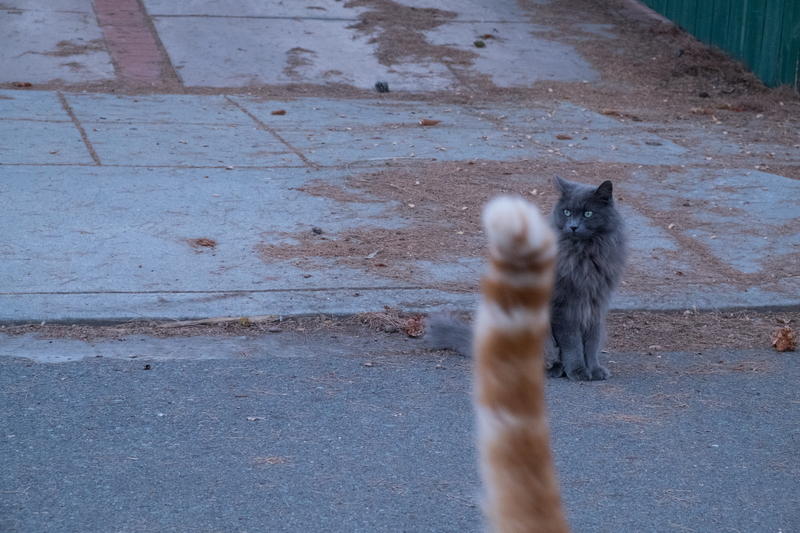 Sure enough, he was there and scurried out to the sidewalk for attention. I also could see Blue, curled up in a pet bed. 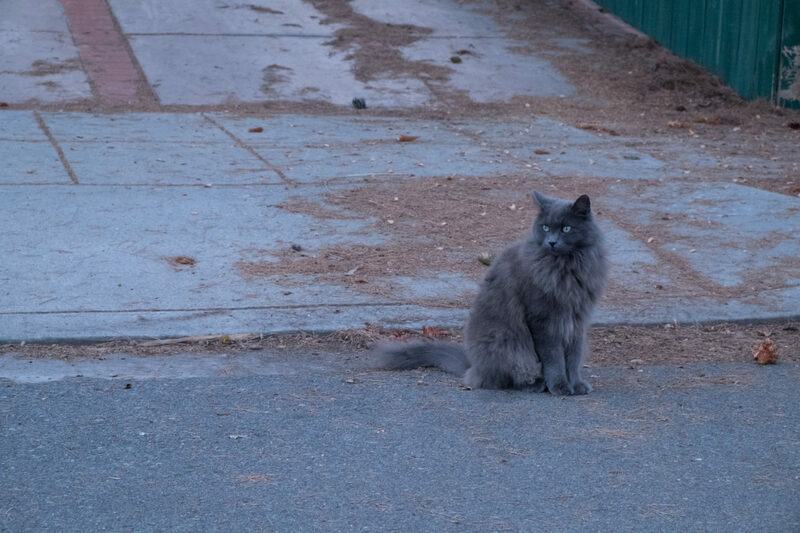 A few minutes after the petting and head-rubbing shoes started, another Blue cat approached from the apartment building across the way. I backed up into the street to shoot the Featured Image, at sunset, 5:58 p.m. PDT. Vitals: f/8, ISO 5000, 1/60 sec, 55mm. The aperture setting was accidental, left from the last time I used the camera. The photo is a JPEG converted from RAW using Adobe Photoshop Lightroom. I just had to post the botched composition, captured two seconds after the first. That’s Chipper’s tale photobombing the portrait. Vitals are same for both photos, which are composed as shot—meaning no cropping. Also featured in this series: Scruffy, Roly Poly, Woo, Skull, Biscuit, The Colonel, White, Frisky, Stretch, Needy, Farfisa, Mates, Hunter, and Pee-Pee.